Houghton Mifflin Harcourt, 9781328832955, 224pp. FRAN HAUSER is a long-time media executive, startup investor and celebrated champion of women and girls. She's held senior positions at some of the world’s largest digital media businesses, including Time Inc.'s People, InStyle and Entertainment Weekly as well as Moviefone and AOL. Now an angel investor who largely invests in female founders, Fran was named one of Refinery29’s “6 Most Powerful Women in NYC’s Tech Scene,” and has been featured by CNBC, Forbes, Vogue.com, Ad Age, and more. 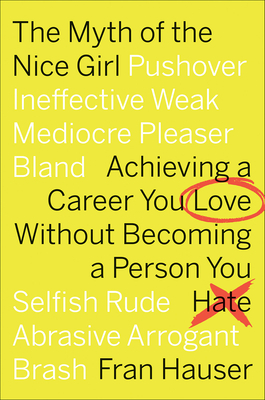 One of goop's "Great Books for Career Inspiration"
One of the muse's "9 Highest-Rated Career Books of 2018, According to Goodreads"
"'The Myth of the Nice Girl' offers useful tips for some of the biggest challenges we face as women in the workplace - speaking up, offering feedback, negotiating - and even word-for-word scripts for when you’re at a complete loss for what to say! “The Myth of the Nice Girl” is the perfect guide to accomplishing your career goals, without sacrificing kindness. "This remarkable book offers simple, accessible, practical steps for achieving a career you’ll love! We all need a little help finding our voice, aligning our values with the way we want to live and even getting unstuck sometimes. I wish I’d had this book when I graduated College."